Mass Effect 2 was very high up on my list of most-wanted games for the first quarter of 2010, and also placed a very close second in our own Readers’ Choice Awards for Most Anticipated Game. Mass Effect 2 even won a convert in our house – The Cavechild did not like Mass Effect 1, but the changes in Mass Effect 2 won him over right through to the game’s final frames and has him looking forward to Mass Effect 3. For my first play-through of Mass Effect 2 (Collector’s Edition) I chose to begin with a new character instead of importing from ME1, so that I could experience all that the story-line had to offer without paying for the sins of my Mass Effect 1 character. Well, along with the fact that I have not yet finished Mass Effect 1 (again) due to a forced re-start of the game because some less-than-honourable gamer stole my 360’s 120gb hard drive during a LAN tournament. The opening cinematics for Mass Effect 2 are impressive and set the stage for much of the shiny newness that makes up Mass Effect 2. 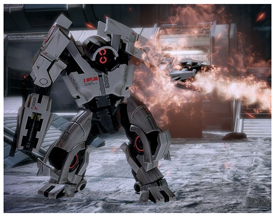 One of the primary new additions to the Mass Effect world is the Cerberus Network, which is available for free with all new Mass Effect 2 games. According to the Mass Effect site, gamers who either rented the game or purchased it used can still access the Cerberus Network by purchasing the option for 1200 Microsoft points. Messages about new DLC and other ME news will be sent to the gamer through the Cerberus Network interface, and much of the DLC for ME2 is free for those who have the Network enabled in their game files. It’s hard to not give out any spoilers to those few who have not yet played the sequel – but it was cool having my female Commander Shepard become the new Jaime Sommers, even if we seem to owe allegiance to the Illusive Man for our resurrection – and it appears that much has happened at The Citadel in Commander Shepard’s absence as well, including a reduced explorable area and a different format for stores. That said, we do get to visit some new and interesting locations, such as the miscreant hangout known as Omega and the decadent Illium, where we find Liara T’Soni in her new occupation as an information broker. There many new and shiny things in Mass Effect 2, not the least of which is the rebuilt Normandy. 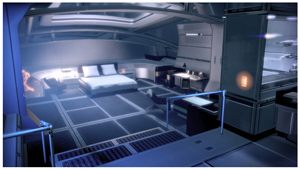 While maintaining the basic layout of the ship, the technology and amenities have been updated, giving Commander Shepard fancy new Captain’s Quarters which can be decorated with spaceship models, a cute little pet and an aquarium in which to collect exotic fish. I was happy to see that Joker still pilots the Normandy, because I would’ve missed his dry wit. His interaction with the ship’s AI adds an amusing level of conversation to the game, and there are many, many homages paid to SCI FI icons throughout the game. I’m not going to spoil it for anyone who hasn’t played ME2 yet, but suffice to say that it’s important to speak with as many characters as possible throughout the game, as well as eavesdrop on conversations whenever possible. As with Mass Effect 1, you gain Codex entries and experience points for talking to people and finding bits of information as well as for completing missions and assignments. The storyline takes a number of interesting twists, and regardless of all the Illusive Man (voiced by actor Martin Sheen) appears to be doing to help out, I do not trust him. Not one bit. 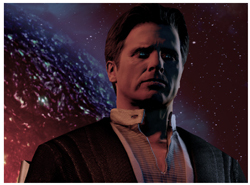 Something in his eyes says he’s up to something, and I’m sure we’re going to find out what it is in Mass Effect 3. Naturally, your actions throughout the game will effect how the story goes for your character, and will also effect the appearance of your Commander Shepard. Sometimes the conversation choices are not easy to make, regardless of how predictable they may seem as far as Paragon/Renegade choices go. Sometimes you will not find out until very late in the game how a conversation option you chose has effected the storyline, which can prevent you from getting an achievement. One new addition to conversation options is Interrupt, and Shepard’s ability with Interrupt, which allows for more physical action, is usually related to the Paragon/Renegade level. One change in the game that I definitely did not like was the planetary scanning and mining. I liked being able to land on planets in the “rover” and drive all over the place and using the big gun to blow enemies into little bits. Those of you who have read my other reviews know that I am not a skilled video game vehicle driver, but I still derive much amusement from commanding and destroying vehicles. Unless there’s a race that I have to win, then it can be a bit frustrating. But, back to Mass Effect 2. Bioware did redeem themselves on the lack of a rover with the newly announced Firewalker Pack, which includes the M57 Hover Tank and five new missions. The Firewalker Pack is scheduled for a late March release, which follows the recently released Arc Projector – a very nifty Heavy Weapon which unleashes more mayhem and destruction on the enemy. I did not find the new “scan and shoot probes” interaction to be engaging at all. I would much rather have been able to land more often and either have a scanner/probe function built into the rover or have the old method of locating something and then getting out of the rover to investigate. The number of actual landings often involved very limited explorable areas and quite often jumped to a cinematic when it became necessary to leave a location in a hurry. I liked having to run through collapsing archaeological digs in Mass Effect 1, and would’ve liked to have continued that type of game play in Mass Effect 2. I did find the space travel parts of the game somewhat more interactive than it was in Mass Effect 1. Now the player has to watch fuel consumption when flying around the galaxy, as well as stock up on probes. The only dog-tag collecting mission was okay, but I personally like having lots of things to collect, and there doesn’t appear to be as much to collect as there was in Mass Effect 1. I did like the new method of obtaining and upgrading weapons, armour and the Normandy. Using the computer terminals to research new technologies was much better than unlocking crates and storage units – and often forgetting that I was carrying a lot inventory. That said, it was also nice in Mass Effect 1 to be able to sacrifice some of that extra inventory for omni gel when it was needed. There are lots of new and improved weapons to obtain, and we all know that one can never have too many big guns. For character attributes, I preferred all of the options which were available in Mass Effect 1. In Mass Effect 2 there doesn’t seem to be as much thought required for where experience points get put, which to me means that you don’t need to put as much thought into how you balance your team. I found that I often used the same characters on each mission, unless a choice was forced due to the story line. That said, I suppose that part of the reasoning behind this change was that this is a sequel – and Shepard should by now know how to use all of his/her skills – the same with the highly trained band of misfits in the squad. So, I can see the logic in this change. 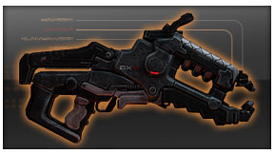 There are also many new powers to learn, and ammunition is handled differently than it was in ME1. Another change I greatly appreciate is the ability to map powers on the 360 controller. I found that playing Dragon Age: Origins has made me a better Mass Effect player in regards to squad skills, and the extra mapping just adds to this, so thank you, Bioware. One thing that I did like was how team members and characters from Mass Effect 1 were worked into Mass Effect 2’s plot line, and Mass Effect 2 knew which (if any – don’t want to spoil it for anyone who hasn’t played ME1 yet) team member may have been “sacrificed” during the Virmire Assault. This was especially interesting for me, because Mass Effect 2 was making choices for me based on my original (prior to my hard drive being stolen) ME1 game play, not my current play-through, which hadn’t yet reached Virmire. I have since completed that mission, making different choices than I did with my original play-through, so it will be interesting to see if my next full play-through of ME2 registers the changes I am making with this new ME1 voyage. I found the writing much improved in Mass Effect 2, although at times I felt that the voice-acting for some of the characters was at times just a bit 0ff. In my opinion, the proper vocal inflections were often not achieved, particularly in the human characters. This tended to make the conversations seem a bit stilted when I was hoping it would be improved over Mass Effect 1. I did enjoy the diverse character stories and backgrounds, and often spent time “talking” with characters in order to learn more of their stories. Codex and experience points had nothing to do with that. They were just a side benefit to sometimes finding out some very surprising and humourous tidbits about my crew members. 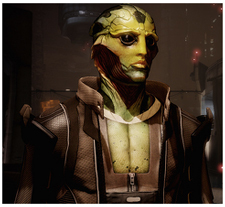 Thus far, I have found the assassin Thane to be the most interesting new character with the greatest amount of depth to his story, but I am looking forward to another play-through which will add Morinth to my squad – just to see how that will effect the story and character interactions. I am also looking forward to adding Kasumi Goto to the squad once she becomes available in April via DLC for 560 Microsoft points. It is important to note that Mass Effect 2 is not really a game which can be rushed through in the way that some gamers seem to enjoy rushing through a game as fast as they can, often skipping key game components. If Shepard is taken into the end game missions without due preparation of the entire squad, chances are the mission will not succeed, and Shepard may even end up in deceased mode. 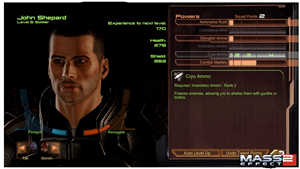 A deceased Shepard cannot return to gameplay after the credits nor be imported to Mass Effect 3, so therefore the player must plan to stay alive – and hopefully the full squad survives as well. The only real problem I have with Mass Effect 2 is that my character gets stuck every so often – either by falling into a hole, getting pushed up on top of a crate by squad members, or stuck in an invisible wall – or a wall that is there but with a partial travel path through it. These events are very frustrating, because there is no way out. For some reason Shepard cannot jump down off of a crate or up out of a hole, and can’t back out of a wall. While Shepard can leap over cover, this is not possible to escape a hole because the walls of that hole are not recognized as cover. This meant that I had to start over from my last save point, and if I had overlooked saving my progress recently, this was sometimes really, really maddening. I was not at all disappointed with Mass Effect 2 and I would highly recommend it to those who enjoy single player RPG adventures. While others have said the game doesn’t hold that much replayability for them, I feel quite the opposite. I feel that the Mass Effect franchise has loads of replayability, not only for various story outcomes, but also different experience levels, plus the direction of the story line in Mass Effect 3 has led to much debate and conjecture in the Village Gamer house. I have logged approximately 140 hours of gameplay in Pandemic’s final title, The Saboteur, and overall I did enjoy the game. I have completed 100% of the freeplay targets as well as the mission campaign, but still have to obtain 1 gold perk and 4 achievements. In my OCD gamer style, I have spent alot of time driving or running around exploring the map, collecting cars, contraband and running into cows. The Saboteur as a game has lots that I like, but it’s impossible to not compare many of the elements to other titles such as Assassin’s Creed, Grand Theft Auto and Prototype. The game opens at a car race where Sean first encounters the nasty Kurt Dierker from Team Doppelsieg. 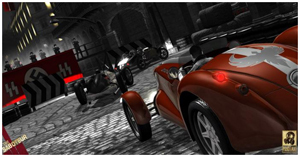 As the game’s hero, you play as Irishman Sean Devlin, who drives for Team Morini. Your best friend Jules Morini, is dead before the first chapter ends, setting the stage for Sean’s thirst for revenge against the Nazis and in particular, Dierker. Sean carries a heavy load of guilt as he heads for Paris with Jules’ sister Veronique and their father, Vittore. It is this guilt and vow of revenge that will enable the British to use Sean as a pawn in their battle against the Nazis. As you delve deeper into the game and storyline, there are more characters who enter the plot – Skylar, the mysterious woman from Sean’s past, Luc who heads up the Resistance, and that sneaky Bond-wanna-be from Britain, Bishop. There are other characters who play minor parts throughout the story, but these are your main game characters. Of course, only Sean Devlin is actually playable by the gamer. I am impressed with the amount of game time offered by The Saboteur – there is certainly a lot to do in the way of collecting postcards, blowing up sniper nests and playing with some really big guns. On the converse side, those of us who have spent much time playing Asssassin’s Creed will be somewhat disappointed with the climbing and jumping abilities which have been given to the main character, Sean Devlin. Granted, he is a race car driver and not an assassin like Altair and Ezio, but I would have expected there to have been better climbing mechanics in a game which places such importance on the ability to reach building tops in order to carry out missions and destroy freeplay targets. There were times when Sean would grab ledges when I didn’t want him to, and times when he wouldn’t make a simple jump or grab a ledge to prevent a suicidal fall, even though I had specified through the controller that he do so. There were several times when I found the game’s controls to be somewhat clunky or unresponsive, and this did lead to some frustration. In many areas, the CaveChild and I have very different views on this title. He is more of an online-multiplayer gamer than I am, and he did, for the most part, like the multi-player portions of this game, except when his 360 headset wasn’t functioning and he’d get kicked from a game because he couldn’t communicate with other players. With teamwork and communication being a huge part of the play, if you are a gamer who does not like to converse with others when playing, this portion of the game is probably not for you. 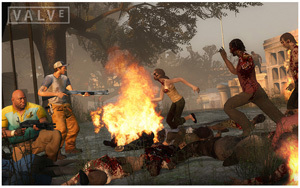 In the online play, you can choose to be either a Survivor or one of the Zombie Bosses, but whichever team you are on, strategy and planning play a huge part in being the victor. I am a gamer who likes to collect things – this mode of game play feeds my OCD-ishness, and for me at least, is an important part of the enjoyable gaming experience. Other than weaponry, there wasn’t anything to collect and horde. Characters are not given a large capacity to carry items, and for those of us who primarily play RPG-style games, this is a huge challenge. 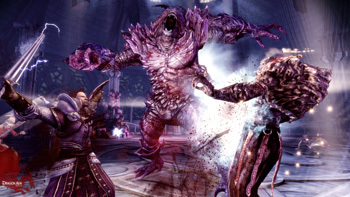 The developers have forced players to use their resources effectively, and the “pray and spray” method of killing massive numbers of enemies isn’t really an option. Thankfully there is a large selection of melee weaponry available – there is something oddly satisfying about whacking a zombie upside the head with a frying pan or cricket bat. Nothing, however, says “Die Zombie!” quite as nicely as the limited-use chainsaw. 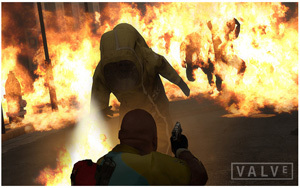 While there are a number of drops to gain extra ammunition, molotov cocktails and other new items such as the bile bomb, in my own opinion it would’ve been a nice option to gain a hunter’s flap jacket at the gun store, thereby legitimately adding a little bit of extra storage capacity, instead of only being able to carry one “bomb item” and one medical kit. One of the areas which I found to be particularly frustrating was in not being sure which way I was supposed to go. While the five maps are not overly large, there are specific areas which gamers must work towards in order to get to the Safe Houses. Some areas were reasonably easy to work through with a well-marked path, while other areas seemed to lack the all-important player clues as to what needed to be done and where. The ability to wander around in a semi-open world is always nice, but so is having a clear idea of where you need to be, particularly when The Director is throwing huge numbers of infected zombie folks at you. There were also too many invisible walls for our preference – and a few areas which could’ve made some great sniper nests were not available. It is somewhat evilly satisfying to literally snipe a zombie’s legs out from under him or her. The atmosphere and setting for the game was appropriately eerie, and I will give the level designers and audio crew extra points for this. However, there were also many instances of clipping failures and targeting problems – there were times when it would take 8 or 9 shots to fall a zombie who was squarely in my sights. It was lots of fun to use the Safe Houses as “duck huts” and snipe zombies or pile up the bodies of those who rushed the door. Having an endless supply of ammo while in the Safe House was also a bonus and added more than just a few minutes to overall game time. I would have liked to have had a longer campaign, simply because that is where my game style preference focuses. I don’t that I would consider Left 4 Dead 2 to be a hugely impressive sequel to Left 4 Dead, but it’s not a complete disappointment, either. With the different play modes which are available and with The Director looking after the AI experience and interaction for horde management and difficulty scaling, there are a decent number of hours of play available to the gamer. On the Village Gamer scale of game approval, we’ve settled on a range of 7.5 to 8.0 for Left 4 Dead 2’s overall product presentation, additions and improvements. The CaveChild and I have been playing Assassin’s Creed 2 almost non-stop since release day, and in my opinion, this is truly the best IP sequel title I have yet to play. Yes, it trumps Modern Warfare 2 in my game selection. We both appreciate the incredible amount of historical research and accuracy that went into Assassin’s Creed – right down to the speeches delivered by the heralds. I am probably one of the few people who actually pays attention to the entire ambience of a game’s environment and utterances of the NPCs. Mike covers much of the game play in the accompanying review video, but there are a few areas I wanted to touch on as well, so we decided to do a joint game review. He has completed the game, whereas I am about 80% complete on the storyline. While there are small parts of Assassin’s Creed (both iterations) that are less than my favourite things to do in the game, they are inconsequential to the overall player experience. I have never been a fan of the race events, although I found the “collect the flag” races in AC1 easier than the gateway races in AC2, this is simply because the flags were easier for me to see on rooftops than the swirling white light effects used in AC2. I could make more use of Eagle Vision during these races, but that seems to add to my mild vertigo reactions to the speed and heights experienced in Assassin’s Creed 2. There have been a few times when I’ve experienced that “roller coaster feeling” throughout the game. My favourite part of game play in Assassin’s Creed 1 were the missions and stealth tactics – and I was well pleased to see this not only continued but built upon in Assassin’s Creed 2. The new assassin abilities and weapons which have been given to Ezio added so much depth to his forays into a corrupt and dark Renaissance Italy, that I keep being disappointed when I run out of Assassin Contracts to fulfill for Lorenzo. For some reason, I find the combat skills in Assassin’s Creed 2 easier to use than when I played through Assassin’s Creed 1, but I’m not really sure why, considering that they are pretty well the same buttons. At times I do get frustrated with movement control, because it seems that Ezio is not wanting to do as he’s told, he’d rather move in a different direction or grab onto something I didn’t want him to, but all is overcome with perseverance – in my opinion it’s better to have to work at something and practice to get it right than for it to be too easy. Speaking of practicing and levels of difficulty, the many puzzles in Assassin’s Creed 2 range from easy to OMG am I ever going to solve this one or beat the timer. It took a fair bit of work to earn those Assassin’s seals to gain Altair’s armour – but it was quite satisfying when I did it, and now Ezio gets to honour Altair by wearing his armour and brandishing his sword. One of the new features in Assassin’s Creed 2 which I really like is ownership of the villa. I enjoyed restoring the town, collecting weaponry, artwork and armour. I only wish that there had been more to do with the villa and town, because I had all of the town’s upgrades completed by the time I had finished the Tuscany map. I also like the addition of the merchants – the doctor is a very welcome NPC and the ability to easily replenish my stocks of poison, medicine, throwing knives, bullets and smoke bombs. I really, really like the smoke bombs. I like being able to swim as well – and I think that the canals of Venice are now a little shallower due to all of the dead guards I’ve sent to their depths. Being able to dive into the water has also save me from countless guard attacks, and also that one time when I couldn’t see if there was a wagon of hay to leap into from the top of a church tower – so I dove into the water instead. Definitely like the non-drowning death improvement – now I just need to work on not falling to my desynchronization from great heights while climbing things. Two of the challenges that I really had fun with were the wild carriage ride and flying on da Vinci’s wings. I only killed Leonardo once on the wild chase through the mountains, and really it’s not my fault that he leaned too far over and tipped the carriage over. My speed and cornering abilities had absolutely nothing to do with it. Flying was a challenge on a whole different level. It only took me a few attempts to get the hang of it and make it to the palace on time. Sort of. Instead of collecting area or faction specific flags as in Assassin’s Creed 2, players now collect the six seals of the Assassin’s Tombs to gain Altair’s armour, the Codex Pages to gain knowledge and weapons in partnership with Leonardo da Vinci, and the feathers which Ezio’s younger brother Petruccio treasured. Ezio must also find glyph symbols hidden around the towns in order to find out more information about the mysterious Subject 16, and taken piece by piece the video clips really don’t make much sense – until you get the big picture. The puzzles attached to the glyphs and Subject 16 are incredibly imaginative, and some of them have taken a lot of hit and miss guessing to solve. No matter their difficulty, though – each one has something of historic value to teach, which I do appreciate. I have now logged over 48 hours of game play (probably closer to 58 now, because I started writing this yesterday) in Bioware’s Dragon Age: Origins (Xbox 360 CE), and there are many aspects I really like, but there are some that may take a bit of warming up to. Having read both of the prequel novels written by Dragon Age lead writer David Gaider, I knew a fair bit of the back-story and my progress through the game has been greatly aided by that knowledge. I am still amazed at the amount of story yet to be revealed through the Codex additions – I have lots of reading of the story’s bits and pieces I have picked up so far through quests, conversations and random items. This is a positive aspect, because I like games which tell a good story. 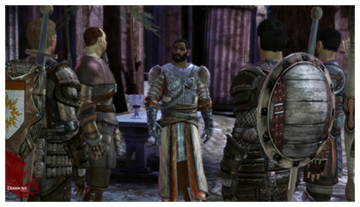 The writing in Dragon Age is tight – and humorous. I have found myself at times just standing and listening to my “henchies” talk, and there has been many a time that I find myself laughing out loud at their dialogue. There are also a number of references to modern pop culture in the game – some of it so subtle that it can be missed if one is not paying attention. The “light” has gone on a few times after certain scenes or dialogues, when I realize what has transpired and its reference to something in our society. I went with the human noble warrior for my first go around – I wanted to be a caster, because that is what I’m good at, but Scott talked me into trying something different. It has become (sometimes painfully) obvious that I am a far better caster than I am a warrior. Thank goodness for the ability to change which party member I can control during battle. I will, however, admit that I am getting better at melee combat. I still have a long way to go at being highly proficient in close-up and personal fighting, but I certainly like the amount of control Bioware gave us in character creation. I also really like that each character – Dwarf, Human or Elf has its own story beginning, as this adds to the replayability factor. Each of the party member’s distinct personalities and beliefs play very important roles in how the game unfolds, as does each choice you make in the dialogue trees. One could almost feel sorry for Alistair as he goes through relentless teasing at the hands of Morrigan, whose own jaded view of the world at large often prevents her from seeing the simple good in people as anything other than weakness. During last night’s play, I caught Wynne also giving Alistair a rough time about filthy socks. Meanwhile Leliana appears to be the complete opposite – she is strong in her belief of all things good, although I have a feeling that this is going to change at some point in time. Just a hunch – and some advance reading on Scott’s part. I haven’t made a lot of use of Zevran and Sten yet, but I’m sure they’ll get their chance in battle as well. I’ve read many online comments about areas where players aren’t happy with the Tactics menu, or they aren’t happy with some of the sudden difficulty spikes. Maybe it’s just my play style, but I am not disappointed by any of it. Yes, some of the battles are insanely difficult and my hero may end up as a pile of ashes after being blasted by a huge fireball, but thanks to the Save Game function which I mostly remember to use, it’s “try, try again” for me. I probably died a dozen times trying to defeat Flemeth before going and doing some different quests first in order to level my Grey Warden some more and perhaps gain a little more help in the way of additional party members. Once I completed the quest for Shale and kicked Alistair out of the party for this particular task, I did it in one go. Shale is a very effective tank when equipped with the right crystals for the job. Next time around I will have to remember to go get Shale before hunting for the urn. Perhaps then I won’t turn into a crispy critter because I just had to ring the gong to see what it did. Apparently the dragon landing on the cliff edge was supposed to be a clue. Maker bless the Load Last Save function. While I sometimes find the long cinematic conversations frustrating, I realize that they are an important game component – dispelling knowledge and opening different paths in the story, but geez sometimes I just want to get on with eliminating the vile creatures who are trying to take over my map. On the plus side is the ability to skip forward through the conversations to get to where you want to be – whether it’s to retry a battle or to try a different path in the dialogue trees. On my next play-through I might just take the time to solve the puzzle and let the little girl live instead of allowing Kitty to possess her. For those who have never heard of Faunasphere, I will borrow a few words from the game’s official site. Please feel free to click on the thumbnails placed through out this article to get a better look at the environment and features, or hover over them for image descriptions. * Fauna lay eggs as they level up. 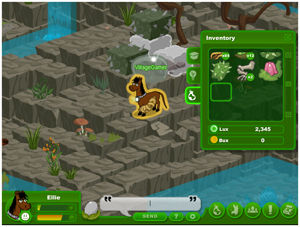 Eggs can be hatched to create new Fauna or traded between players. * 12 Fauna breeds to adopt and care for, with an endless array of visual variations to explore. Players can try to breed Fauna for specific traits, or can purchase special items to transform them. 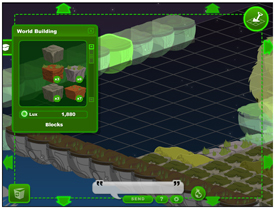 * Players can customize their own corner of the world by designing a Faunasphere to shelter their Fauna. Items to decorate and improve a player’s Faunasphere can be collected via game play, traded between players, or purchased. 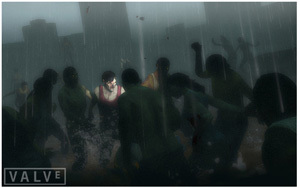 * Players advance through the world via unique, non-violent game play. Fauna clean up pollution and complete tasks to earn game currency and level up. * The game can be played as a no-commitment diversion, but offers deeper involvement for committed players. 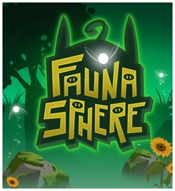 Faunasphere is very easy to play. While reading is required, the game play is simple to pick up, the characters are cute – and sometimes very unique depending on how their caretakers have customized them, and the game’s community is incredibly friendly. That is one aspect of the game that really struck me. I know from reading through the game’s community forums that there have been problem users, just like in any online game. That said, the players who inhabit Faunasphere are friendly and even considerate. They even give you items if they think they somehow “stepped on” something you were doing or planning to do. They readily offer assistance should anyone require help with a task or cleaning up some of the higher-level pollution monsters. 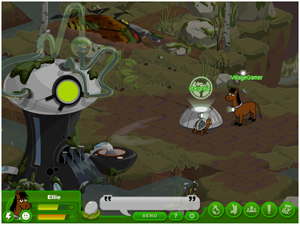 For my adventures into the Faunasphere, I chose to look after one of the Hoofers, which are horse-like characters. 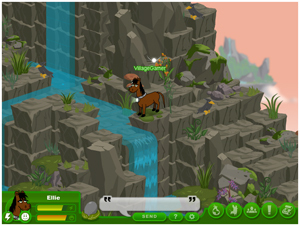 Players can choose from a Hoofer, Sniffer or Scooter, each with its own set of attributes, likes and dislikes. Each character likes different food, comfort, beauty and amusement items. These likes and dislikes are important to bear in mind when building a faunasphere, and particularly when you create a Den for your Fauna to rejuvenate in. Your Fauna likes to be in a place which makes it happy, so it’s important to use the “Happy” items which your Fauna prefers. Aldergrove – The day Ubisoft released Teenage Mutant Ninja Turtles: Turtles In Time Re-shelled on XBLA, Mike had to have it. Turtles in Time was one of the Nintendo games which he played almost constantly when he was younger – it was right at the top of his playlist along with Mario and Donkey Kong. TMNT Turtles in Time Re-shelled was developed by Ubisoft Shanghai and is available on XBLA for 1200 Microsoft points. Watch the cavechild’s mini video review, and find out why he gives it a 10 out of 10 game play rating. Gravity Well is a level puzzler which requires the player to maneuver a little blue ball from one end of a maze to the other. 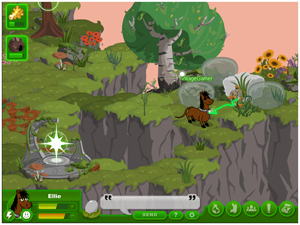 There is an optional tutorial available, and game options permit the player to adjust the volume for both effects and music. The soundtrack, created by The Humble Brothers is not at all irritating and is of higher production quality than many of the mobile games out on the market. The soundtrack is also available for purchase in the iTunes store. If you have to quit the game for whatever reason, you can select the level you were at or any other level which you’ve completed when you restart the game. Gravity Well also allows the player to put the game on pause if needed. Gravity Well’s developers have a distinct knack for making the player think and find creative ways to control the ball as it moves through each maze. 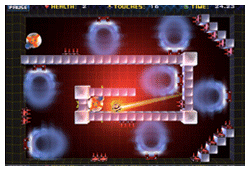 The ball moves when the player touches the screen, warping the grid a creating a “gravity well” which pulls the ball. It’s not always as easy as it seems to get the ball through the grid, because the game’s gravity force is not affected by the tilt of the iTouch or iPhone. It was a long wait for me to play Radical Entertainment’s newest title – from the day I first heard about the game at the 2007 Game Design Expo. The Activision – Blizzard merger didn’t help the matter by delaying the game’s release, and my envy grew as there were reports back from various conferences and expos where people were getting hands-on playtime. So, was it worth the wait? Oh yes – although this has been a difficult review to pen, simply because PROTOTYPE is so full of things to do and accomplish. One bit of caution, though – PROTOTYPE is rated M by the ESRB for a very valid reason. The game is violent and involves massive amounts of blood and gore, which I do mention in further detail throughout this review. If you do not want your kids playing games like PROTOTYPE, the ratings are there for a reason, please don’t blame the industry if you allow your kids access to a game outside of their age rating. Okay, end of brief soapbox stance on that topic. On to the review. First, a quick plot rundown for those who may still be in the dark as to what the game is all about. PROTOTYPE takes place in New York City, more specifically on Manhattan Island – but in actuality the story began decades earlier in a small town called Hope, Idaho. It appears that the US military was engaged in a partnership to develop a deadly virus – one which affects not only humans but the environment as well, and along the way Alex, who apparently worked for Gen-Tek, the private contractor developing the virus strains, became some type of host, turning him into a part human-part super weapon entity. Or maybe he is a viral PROTOTYPE, released on the American public for in-the-field testing. Even with watching the Web of Intrigue vignettes a few times, I’m still not 100% sure – and to be honest, I kind of like it that way. A little mystery is good – and it makes for good fodder among the conspiracists out there on the web. 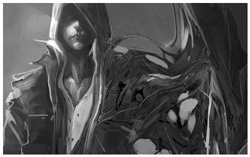 PROTOTYPE is a single player game, with the gamer taking on the persona of main character Alex Mercer. 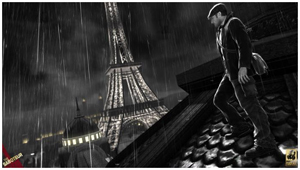 Whether Alex is good or bad is unclear at the beginning of the game, but either way it does appear that he has a conscience, which is revealed in mysterious cinematic vignettes between each task – but like all other parts of this game’s story, Alex’s motives remain infected (pun intended) with intrigue.